A nationwide blackout in India has left some 600 million people without electricity. Given that a large number of the contractors on oDesk are from India, I assumed that effects of the blackout would show up readily in the oDesk data. This evening, I wrote a query to get the hours worked each day by Indian contractors during the last month and the number of applications sent. I divided these counts by the respective totals for that day for all of oDesk. From this time series, we can get a sense of what was supposed to happen today and compare it to what actually happened. The time series for applications (top) and hours worked (bottom) are plotted below , with today annotated in red. Each percentage estimate has a 95% confidence interval. There is a very easy to detect drop-off in the hours worked—my eyeball calculation says they should have been responsible for around 22% of the hours worked today, while the actual number is closer 17.5%. This is far less of a fall-off than we would naively predict from the “1/2 of Indians without power” headline. Presumably many contractors have access to private generators, or perhaps oDesk is over-represented in parts of the country that were less affected by the blackout. There is no corresponding obvious drop-off in the fraction of applications. I don’t have a good explanation for this, but perhaps non-affected Indian contractors have made up the difference and exploited the now-thinner market. If I can get some data on what parts of the country are actually being affected by the blackout, I could test this notion since I do have contractor locations down to the city level. 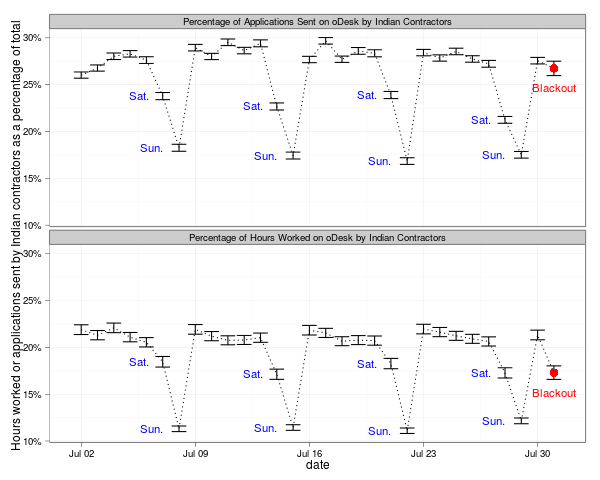 Indian contractors take weekends off, both in terms of working and job finding (or at least more so than their oDesk counter-parts from other countries). Remember that this time series is the fraction for a given day, so there’s no reason for a strong weekend/weekday pattern. See oDesk Country Explorer for more of this kind of data. Indian contractors are generally over-represented in the application pool, making up ~25% of applications but only about ~20% of hours worked, though this could easily reflect differences in the kinds of categories Indian contractors work in—there is a great deal of variance in the average number of applications per opening across the different job categories. This entry was posted in Uncategorized on August 1, 2012 by johnjhorton.